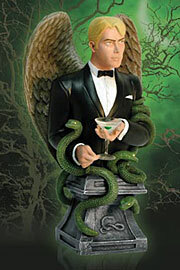 Lucifer continues the line of VERTIGO Mini-busts! Lucifer, the retired Lord of Hell, is a cunning, Machiavellian character who rules his own cosmos and has little care for anyone but himself. This limited-edition, hand-painted cold-cast porcelain mini-bust measures approximately 5 7/8" tall and is packaged in a 4-color window box.